I started thinking about the negative posts I have been reading in the comments sections of articles that celebrate music festival lineup releases. Every day I go out to my favorite sites, Consequence of Sound, Brooklyn Vegan and Rolling Stone, to see what is going on in the music world. One of my favorite times of the year is lineup release season to get ramped up for summer festivals. I constantly am checking my sites during this time to see how people are reacting to the release. Alex Young from Consequence of Sound gave a great synopsis of the Bonnaroo lineup a couple days ago, providing detailed reasoning for his comments and thought it had the potential to be in his mind "Festival of the Year". I then check the comments section of the review and it is nothing but people bashing the crap out of it because they don't agree with it. I realized that there are so many different opinions of a festival because it is all subjective. Nobody is ever right or wrong when it comes to their opinion of the review. It is their own opinion and they have the right to have it. Though I wanted to provide a more objective way of deciding which really is the best lineup. I started to think, why not create something that provides the correct opinion based on data? 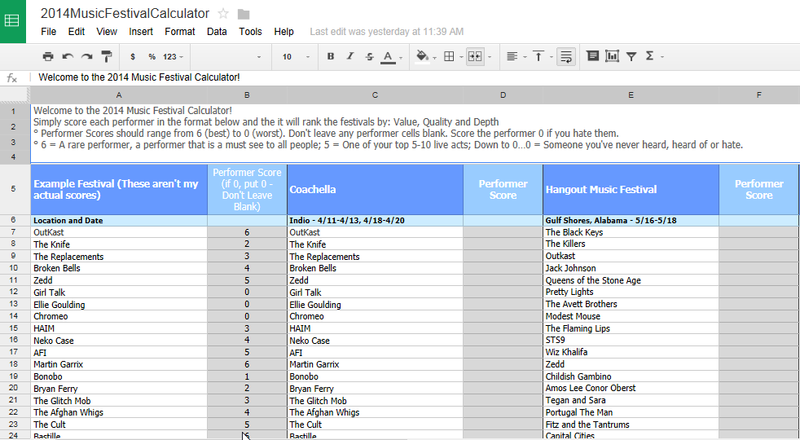 I then started tinkering around with an Excel Spreadsheet to put together some sort of a calculator to determine best festival. I came up with a nifty little tool that may settle debates....or create more. Hey, I get part of the fun is debating the lineups. I love doing that too, but why not have something to settle the debate? 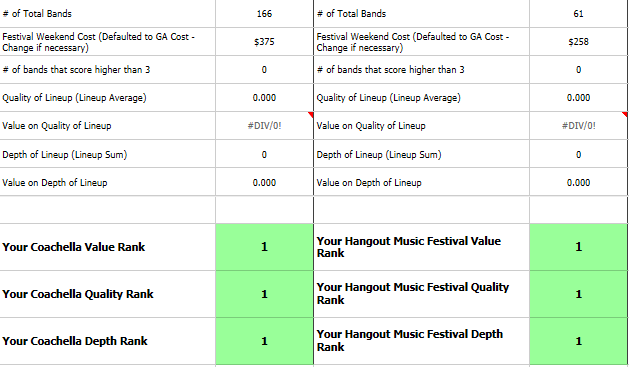 I call it the 2014 Music Festival Calculator and matches the festivals up against each other using a band scoring method that ranks Best Value, Best Quality and Best Depth Festival. Unfortunately, I created it in Microsoft Excel and there is no easy way to upload an Excel doc to Blogger. So I had to upload using Google Docs and it might be a little slow. 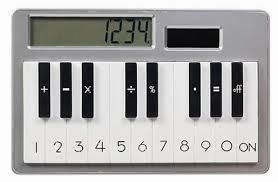 Let me know if you'd like the MS Excel version as I'd be happy to email it to you. Check out the tool by clicking the link below. Wow, this is really awesome dude. This should have gotten you a ton of attention.